Emperor Kōmei (孝明天皇, Kōmei-tennō, 22 July 1831 – 30 January 1867) was the 121st Emperor of Japan, according to the traditional order of succession. Kōmei's reign spanned the years from 1846 through 1867, corresponding to the final years of the Edo period. During his reign there was much internal turmoil as a result of Japan's first major contact with the United States, which occurred under Commodore Perry in 1853 and 1854, and the subsequent forced re-opening of Japan to western nations, ending a 220-year period of national seclusion. Emperor Kōmei did not care much for anything foreign, and he opposed opening Japan to Western powers. His reign would continue to be dominated by insurrection and partisan conflicts eventually culminating in the collapse of the Tokugawa shogunate shortly after his death and the Meiji Restoration in the beginning of the reign of his son and successor Emperor Meiji. 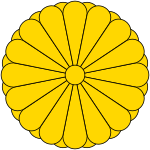 2.2 The "Order to Expel Barbarians"
Before Kōmei's accession to the Chrysanthemum Throne, his personal name (imina) was Osahito (統仁) and his title was Hiro-no-miya (煕宮). Osahito was born on July 22, 1831 and was the fourth son of Emperor Ninkō and his consort Fujiwara no Tsuneko (藤原雅子). Osahito's Imperial Family lived with him in the Dairi of the Heian Palace. Prince Osahito was enthroned as Emperor Kōmei on March 10, 1846 upon the death of his father. The succession was considered to have been received by the new monarch; and shortly thereafter, Emperor Kōmei is said to have acceded the throne. The years of Kōmei's reign correspond with a period in which Tokugawa Ieyoshi, Tokugawa Iesada, Tokugawa Iemochi, and Tokugawa Yoshinobu were leaders at the pinnacle of the Tokugawa shogunate. On July 8, 1853 US Commodore Matthew Perry arrived with his "Black Ships" to force trade with Japan. The Tokugawa shogunate, which had controlled military and civil affairs in Japan's feudal provinces for some three centuries, proved unable to meet the new challenge of open trade with the West. At the time, Emperor Kōmei still retained only symbolic power at his court in Kyoto. As the shogunate, divided by internal disputes, gradually surrendered sovereignty to the foreign powers, under threat of military force, Emperor Kōmei began to assert himself and regain many of the powers his ancestors had conceded to the Tokugawa clan at the close of the Sengoku ("warring states") period. The Emperor's younger sister, Imperial princess Kazu-no-Miya Chikako (和宮親子内親王), was married to the Tokugawa shōgun Tokugawa Iemochi as part of the Movement to Unite Court and Bakufu. Both the Emperor and his sister were against the marriage, even though he realized the gains to be had from such familial connections with the true ruler of Japan. Emperor Kōmei did not care much for anything foreign, and he opposed opening Japan to Western powers, even as the shogun continued to accept foreign demands. On January 22, 1858, Daigaku-no-kami Hayashi Akira headed the bakufu delegation which sought advice from Emperor Kōmei in deciding how to deal with newly assertive foreign powers. This would have been the first time the Emperor's counsel was actively sought since the establishment of the Tokugawa shogunate. The most easily identified consequence of this transitional overture would be the increased numbers of messengers streaming back and forth between Edo and Kyoto during the next decade. Concerning these difficult Imperial audiences in Kyoto, there is no small irony in the fact that the shogun and his bakufu were represented by a 19th-century neo-Confucian scholar/bureaucrat who would have been somewhat surprised to find himself at a crucial nexus of managing political change—moving arguably "by the book" through uncharted waters with well-settled theories and history as the only reliable guide. Hayashi Akira was dispatched from Edo to Kyoto in October 1858 to explain the terms of the Treaty of Amity and Commerce (日米修好通商条約, Nichibei Shūkō Tsūshō Jōyaku), also known as the Harris Treaty. Hayashi's twofold task was to both explain the terms to a sceptical Emperor and gain the sovereign's assent to it. Kōmei did ultimately acquiesce in February 1859 when he came to understand that there was no alternative. The pilgrimage of the 14th shogun Tokugawa Iemochi to Kyoto in 1863 was a defining moment not only in 19th century relations between the military bakufu and the Imperial Court, but also in what history would come to call the Meiji Restoration. The reception by Emperor Kōmei of the shogun in the Kyoto palace can be seen as a moment at which the political realm was thoroughly redefined, becoming a transitional imperial realm. This impression was enforced by the ensuing pilgrimage by Emperor Kōmei to the Kamo shrine, with the shogun in tow. This public demonstration showed that a new order had now emerged in the realm. After reluctantly accepting the Harris Treaty, Japan quickly signed similar treaties, called the Ansei Treaties, with Russia, France, Great Britain, and the Netherlands. These Treaties were widely regarded by Japanese intellectuals as unequal, having been forced on Japan through gunboat diplomacy, and as a sign of the West's desire to incorporate Japan into the imperialism that had been taking hold of the continent. Among other measures, they gave the Western nations unequivocal control of tariffs on imports and the right of extraterritoriality to all their visiting nationals. They would remain a sticking point in Japan's relations with the West up to the turn of the 20th century. Emperor Kōmei was infuriated with nearly every development during his reign as Emperor, and during his lifetime he never saw any foreigners nor did he know much about them. Unequal trade treaties with the Western powers, such as the Treaty of Kanagawa and the Harris Treaty were signed without Imperial sanction and in spite of the Emperor's refusal to approve them. He twice expressed his will to resign from his position in protest. During his reign he started to gain more power as the Tokugawa shogunate declined, though this was limited to consultation and other forms of deference according to protocol. Emperor Kōmei generally agreed with anti-Western sentiments, and, breaking with centuries of imperial tradition, began to take an active role in matters of state. As opportunities arose, he fulminated against the treaties and attempted to interfere in the shogunal succession. His efforts culminated in 1863 with his "Order to expel barbarians". Although the Shogunate had no intention of enforcing the order, it nevertheless inspired attacks against the Shogunate itself and against foreigners in Japan: the most famous incident was the slaying of British trader Charles Lennox Richardson, for which the Tokugawa government paid an indemnity of one hundred thousand British pounds. Other incidents included the bombardment of Shimonoseki and Kagoshima, and the destruction of Japanese warships, coastal guns, and assorted military infrastructure throughout the country. These incidents showed that Japan could not match the military might of the Westerners at the time, and that confrontation could not be the solution. In January 1867 the Emperor was diagnosed with smallpox, which caused surprise because Kōmei had allegedly never been ill before. On January 30, 1867 he suffered a fatal violent bout of vomiting and diarrhea, and had purple spots on his face. Emperor Kōmei's death was distinctly convenient for the anti-bakufu forces whom Kōmei had consistently opposed. It was rumored at the time that he was assassinated either by radicals from Choshu, or radical officials in the court. British diplomat Sir Ernest Satow wrote, "it is impossible to deny that [the Emperor Kōmei's] disappearance from the political scene, leaving as his successor a boy of fifteen or sixteen [actually fourteen], was most opportune". However, there is no evidence of this and it is generally believed that he was simply one more victim of what was a worldwide pandemic at the time. Nevertheless, by the time of Emperor Kōmei's death the government was faced with bankruptcy and near collapse. Japan was also surrounded by colonial powers, who stood poised to gain considerable influence with substantial investments in Japanese trade. Kōmei's son, Imperial Prince Mutsuhito was crowned as Emperor Meiji on September 12, 1868 and these issues were put to rest under the Meiji Restoration. The family included six children, four daughters and two sons; but the future Emperor Meiji was the only one to survive to adulthood. The Kōmei principal consort was Asako Kujō (九条夙子). After Kōmei's death in 1867, Asako was given the title Empress Eishō (英照皇后) by Emperor Meiji. ^ Ponsonby-Fane, Richard. (1959). The Imperial House of Japan. pp. 123–135. ^ "Japan:Memoirs of a Secret Empire". PBS. Retrieved 2007-08-11. ^ Ponsonby-Fane, p. 123. A distinct act of senso is unrecognized prior to Emperor Tenji; and all sovereigns except Jitō, Yōzei, Go-Toba, and Fushimi have senso and sokui in the same year until the reign of Emperor Go-Murakami – see Varley, H. Paul. (1980). Jinnō Shōtōki, p. 44. ^ Nussbaum, Louis-Frédéric et al. (2005). Japan encyclopedia, p. 502. ^ Cullen, L.M. (2003). A History of Japan, 1582–1941: Internal and External Worlds, p. 178. ^ Ponsonby-Fane, Richard. (1956). Kyoto: the Old Capital, 794–1869, p. 324. ^ Jansen, Marius. Sakamoto Ryoma and the Meiji Restoration Footnote, p. 282. Janen Marius. The Making of Modern Japan p. 324. ^ Ponsonby-Fane, Imperial House, p. 423. ^ Ponsonby-Fane, Imperial House, p. 335. ^ Ponsonby-Fane, Imperial House, p. 17. ^ Ponsonby-Fane, Imperial House, p. 125. ^ Ponsonby-Fane, Imperial House, p. 334.